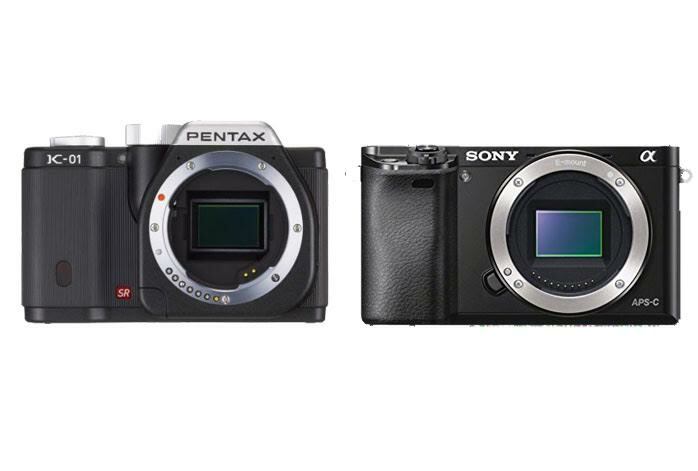 Not sure whether to choose Pentax K-01 or Sony a6000? Well, the two models are both mirrorless cameras available in a similar price range. They are both popular among people who want to get a decent and reliable mirrorless camera without breaking the bank. So, which is the one that you should get? Read the comparisons below before you make your choice! In terms of design and feature, Sony a6000 comes with a bunch of cool and neat things, but Pentax K-01 is not without its strengths. Sony a6000, although being a thud bulkier than Pentax K-01, is quite considerably lighter. As the effect, Sony a6000 becomes very comfortable and solid to handle. Furthermore, Sony a6000 features an articulating screen. This feature makes it possible to capture shots from tricky angles more easily. Also, Sony a6000 comes with an electronic viewfinder for better framing. On the other hand, however, Pentax K-01 comes with a microphone port – something that Sony a6000 lacks. With a mic input, you can capture high-quality audio to complement the video. In addition, Pentax K-01 features a flash sync port, allowing you to connect an external flash to integrate with the camera. The flash coverage is better, and it also has built-in image stabilization. However, talking about performance and output quality, Sony a6000 easily outclasses Pentax K-01. While Pentax K-01 relies on a 16 MP image sensor with 25,600 maximum ISO, Sony a6000 offers a 24 MP APS-C CMOS sensor with 51,200 maximum ISO. Not only it can deliver larger, sharper, more detailed images, but also the colors are more solid and more accurate. Sony a6000 also comes with a much more powerful autofocus system. It boasts 179 phase detection points combined with contrast-based movement detection to deliver superior tracking performance. Meanwhile, with a continuous shooting speed of 11 fps, Sony a6000 is certainly a viable choice for sports photography. Last but not least, Sony a6000 features built-in Wi-Fi and NFC. Pentax K-01’s photo burst is only 6 fps and is without any wireless connectivity. - Mirrorless body design with Pentax K mount lens compatibility that allows any Pentax K mount lens to work. Pentax K-01 can be a great choice only for specific purposes. If you are going to use your camera mainly for portrait photography, then you will benefit greatly from the sophisticated flash system and image stabilization. Another reason to pick Pentax K-01 is if you require the mic port. Otherwise, you should go with Sony a6000, which boasts superior image quality and performance.